Social Media has revolutionised how we shop, research and buy. 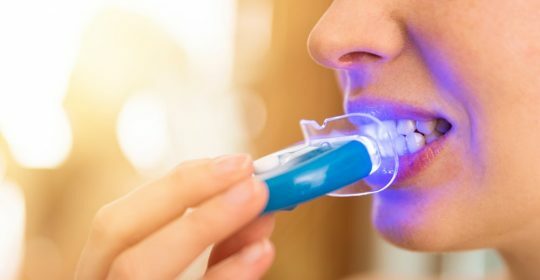 Teeth whitening products have become easily accessible and promoted by the likes of social media influencers – but are they more harmful than good? Find out what you need to know before investing in whitening products, and the dangers of products not supplied by a dentist. Perth 9 News reported that Perth dentists are alarmed at the increasing number of people suffering serious damage from at-home teeth whitening kits. The popular teeth whitening kits include so-called whitening gels activated by blue LED lights for 10 minutes per treatment. The self-administered treatment has been a result of an online craze influenced by online personalities and sponsored by teeth whitening companies. The online personalities claim the treatment to be easy and effective. However, dentists warn that the treatment is doing damage. Studies have shown that the LED treatment does not lighten teeth, but rather shoots the nerves, which can actually kill the teeth. Beyond this, for people with untreated dental issues, at-home whitening kits can increase the risk of further damage and complications. If you can identify any of the following symptoms, you should consult with your dentist before attempting to whiten your teeth. Every patient is different and requires a customised treatment. Consult with your dentist on the best course of action. At a dental practice, there are two approaches to teeth whitening: intrinsic and extrinsic. Intrinsic: Intrinsic whitening refers to the inner part of the tooth. The treatment consists of injecting hydrogen peroxide gel into the inner tooth. The gel brightens the inner tooth and consequently lightens the outer enamel. Extrinsic: People with staining from coffee, tea, wine and other staining agents that have caused tooth discolouration use extrinsic whitening to whiten teeth. Extrinsic whitening removes staining from the outside in. Consult with your dentist for the best treatment for you. In most cases, a dentist can offer the most effective and appropriate whitening treatment for your teeth. At a dental practice, all treatments are supervised and applied according to dental protocol. Karalee Family Dental is a trusted local Brassall dentist. If you have any questions regarding the best oral health plan for you, contact us today.